Austin Caperton Jnr established the Glade Springs resort in the early 1970s and he commissioned George Cobb to design the first course on the estate, now simply called the Cobb course. Thirty years later, Tom Clark’s Stonehaven layout became the second 18-hole course on the property and such was the acclaim that greeted this course, he was asked to add another 18 holes. This layout, named Woodhaven, opened for play in 2010. 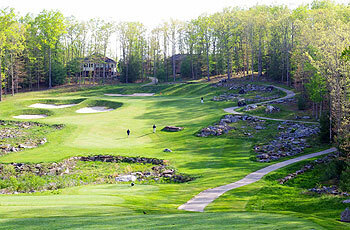 Developer Cooper Communities and resort operator Bright Enterprises were the companies that combined resources to put the Stonehaven course on the West Virginian map in 2003, entrusting architect Tom Clark with its design. The developer had been involved with the Ault, Clark & Associates design group before (when constructing similar golf projects in Arkansas) so it was fully confidant that Tom Clark would deliver a spectacular mountain course, carving fairways through mature hardwood forest and cleverly incorporating the beautiful Chatham Lake into the out-and-back routing. Clark has kept things as natural as possible on a layout that features many dramatic changes in elevation during the round. Particularly pleasing to the eye are the many waste bunkers which contrast brilliantly with the more traditional sand traps. Rocky outcrops – more common in the likes of the Canadian Muskoka region – are another wonderful, distinctive feature to be found on many of the holes at Stonehaven and there’s plenty of this attractive stonework to be found on the layout’s signature hole, the 221-yard, par three 6th. The course complements the existing “Cobb” course and is built not only to be a stand alone country club, but also to enhance surrounding home sites. We have very wide corridors, which allow the golfer to experience the beauty of the surrounds and not feel trapped between rows of houses. The course is designed with non-returning nines, but a halfway house is provided, along with shelters at the farthest extremes of the routing. The topography is more dramatic than the Cobb course featuring striking rock outcroppings, and is carved through a forest of mature oak, maple, beech, and hickory along with huge rhododendrons for understory. The course loops around both sides of a new 70-acre lake which also provides water as a source of irrigation. “Natural rock gardens” are planted with fescue and wildflowers, “waste areas” featuring black coal slag, and “native areas” enhance the strategy and playability of the course. Rock walls and outcroppings are the theme that runs through all 18 holes. The greens are a selected variety of Bentgrass, and average around 6,000 square feet in area, featuring “bailout, chipping, and collection areas” around their periphery. Tees are Bentgrass and the length ranges from 7,228 yards from the black to 5,290 yards from the forward tees. Spacious Bentgrass fairways provide a year round green carpet from which to play, and they’re surrounded with a visually striking bluegrass rough. We’re happy that Stonehaven has taken its place among the top facilities, not only in West Virginia, but the entire east coast. I really can’t share Mr Finn’s gushing enthusiasm which seems more marketing than reality. Stonehaven is good resort course (I’d rate it 4.5 out of 6), but it will never get a sniff at the US Top 100 and quite rightly so. When a reviewer rates a course like this so highly I have to wonder whether the reviewer is a marketer or simply ignorant. Dear Niall. Thank you for taking the time to comment on my review however I strongly disagree that my opinion is biased. I have played over 800 golf courses worldwide and honestly believe that Stonehaven is one of the finest mountain courses that I have ever experienced. You may feel differently and that is your prerogative. I would welcome your own review on why you think differently. Dear BB. Thank you for chiming in. I have in fact rated 16 courses in Canada and 10 of them I gave a 6-ball rating, 4 at 5-ball and 2 @ 4-ball. In my opinion these courses are some of the best in Canada. I am not involved in destination marketing nor do I have any business relationship with these clubs. Perhaps I should be more critical in the future to appease the doubters. If you have played any of these courses I would welcome your review to compare with mine. Dave, I meant to be disparaging, not because I have an axe to grind but to manage the expectations of others. As I’ve already mentioned, I’d rate the course around 4.5, so I think it’s a good course. My point is simply that your review reads like marketing puff when you mention the cost of packages and the quality of guest rooms and suites etc. As good as the course may be, it’s not a world-beater in my opinion, but for a residential course with all the surrounding properties, the architect has done a good job of keeping the course front and center of the bricks and mortar.